Did most Stone Age people have all their fingers? According to the paintings they left behind, many of them did not. 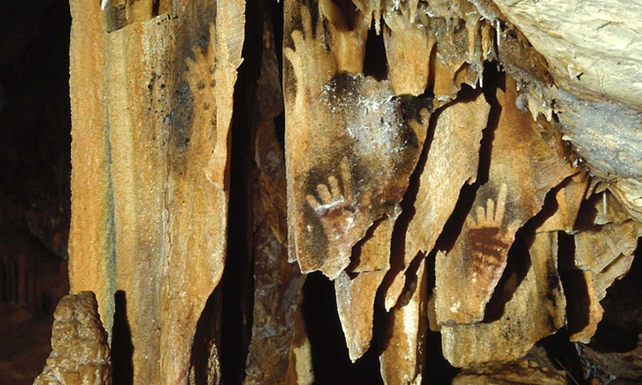 Plenty of cave paintings depict hands with missing fingers, and a trio of researchers believes they know why: those people had their fingers deliberately amputated. Right now it’s still a guess, but the researchers believe future evidence will help illuminate a strange and fascinating practice from our distant ancestors. Stone Age people are some of the most fascinating, from an anthropological perspective. Using nothing more than rocks, sticks, and their own ingenuity, these people managed to build tools, master fire, establish complex societies, domesticate dogs, and spread throughout nearly the entire globe. Starting around 50,000 years ago—a period that scientists refer to as the “Upper Paleolithic”—they started leaving behind all kinds of art and artifacts for modern scientists to discover. Researchers from Simon Fraser University in Canada felt like there were too many missing fingers on too many paintings in too many parts of the world for the whole thing to be a coincidence. It’s impossible to ask these people what’s going on, so the researchers looked at modern and historical tribes to see if any of them do the same thing. What they found is that not only do people cut off their fingers, the practice is surprisingly common. The researchers found 121 cultures from around the world that had some sort of finger-amputation practice.